MARQUETTE — With the subzero temperatures were having it can be tempting to wander out onto newly formed ice and explore. But, taking that first step is walking into something that appears less dangerous than it really is. This morning the Marquette Fire Department ventured out in Lake Superior for their semi-annual ice water rescue practice. Regular practice like this ensures First Responder’s know how to react in any situation. Learning proper communication in tense situations can make all the difference. During their practice they wear suits made from special insulated rubber to keep them warm. “The main thing is our suits, that allows us to go into the water and it keeps us warm. We have ropes; we have a harness that looks like a pool noodle. 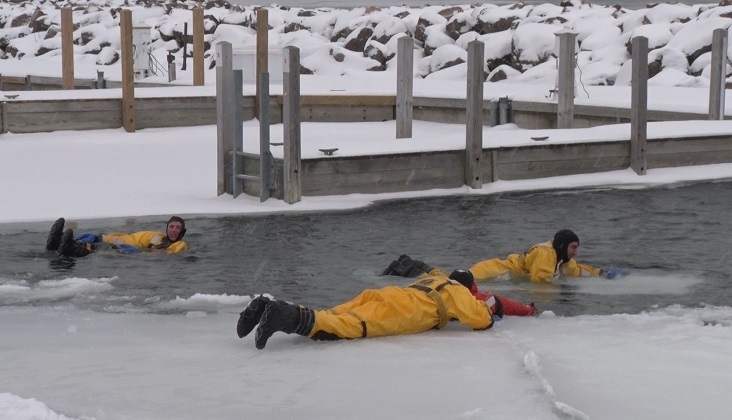 When a person isn’t able to self rescue or they are alter level of consciousness, we can get that around them and hook that up to the rope; then assist them out of the ice,” Kurt Hillier, Lieutenant / Paramedic. Time is of the essence and First Responder’s have just minutes to rally together and communicate with the individual. “If the ice is stable enough to get close to the victim we’ll talk to them, try to get their level of consciousness. We’ll see if they can self rescue themselves or if it’s something that we can get them a rope and assist them out that way. Or if we actually have to get into the water with the victim and get them out that way,” Hillier added. If you find yourself or someone else has fallen in the water, your body can go into a state of shock. Making your reaction time slower, which can be the difference between life and death. “Try not to panic, try to find some good solid ice and get your arms up on it. Unfortunately if you are there for awhile, you can almost stick to the ice. That way it will keep you from going underneath,” said Hillier. Finally if you do plan on going out on the ice make sure the ice is stable, try to go with a partner and dress appropriately.